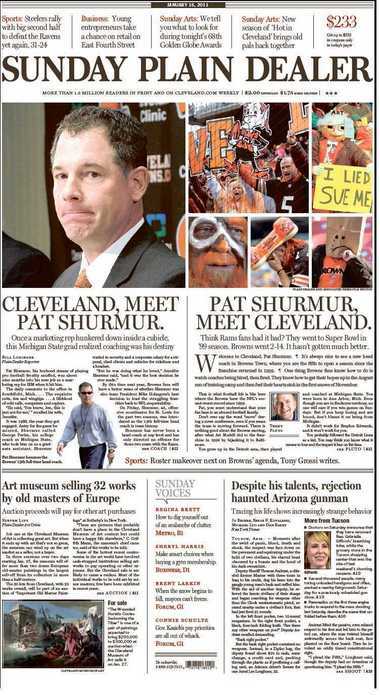 Check out who's on the front page of the Plain Dealer! Great 30th birthday gift idea! YOU'VE HEARD OF WHERE'S WALDO, WE CALL THIS ONE "WHERE'S SATCH?" SEE WHAT IT"S LIKE TO FACE THE BELIEVELAND ENDZONE! PLAY MADDEN FOOTBALL! Thanks to one of our favorite ticket guys for pointing that one out to us!!! Thanks to Skip for finding that one - it's a BEAUT ! Thanks Skip, Quickdog, and Balls! Have you seen us anywhere else? Send us an email we'll add it to the site!